Two recent DVD releases from the BFI offer up some rarely seen treasures. 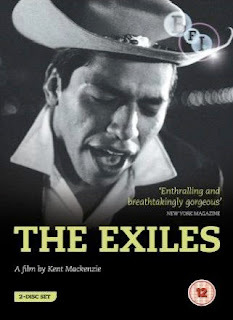 The Exiles is a short documentary from Kent Mackenzie, released originally in 1961, and depicting the lives of a group of young American Indians over a 24 hour period. 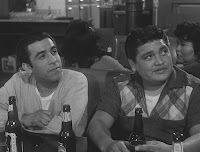 Set in the Bunker Hill area of Los Angeles, the film was three years in the making for director, writer and producer Mackenzie and it captures the ebb and flow of a densely populated area of the city that was home to retirees, immigrants and the transplanted Indian exiles that are the focus of the film's themes. 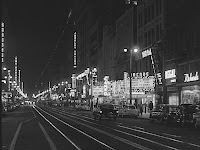 This is a stunningly photographed black and white gem, recently restored by UCLA, that makes visual poetry out of the faded and delapidated area, lit by neon and marked by a rootless down and out atmosphere. At the centre are a group of friends and their intertwining paths during the course of one night as they go out drinking, dancing, fighting, gambling and eventually to congregate above the city and reconnect with their tribal customs. It opens with a slightly dislocated sequence of photographs of North American Indians by Edward Curtis accompanied by a sombre voice over that suggests this is going to be a dry, dusty piece of documentary. Don't let that fool you because The Exiles brims with life, buzzing with sights and sounds and captures something of the lives of these urban immigrants, their cramped living conditions and the antagonistic relationships between men and women, wives and husbands. We follow Homer, Yvonne and Tommy as they attempt to come to terms with the unfulfilled promise of the American dream and the rather sordid and faded reality that's actually their lot. 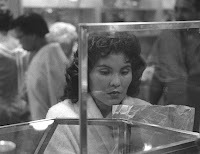 Yvonne spends her time fetching and carrying for her husband Homer and then whiles away her hours at the cinema, at a friend's house or gazing into shop windows at goods she will never be able to afford. Homer hits the bars with Tommy and gets up to no good, joining a card game thinking he might get lucky. 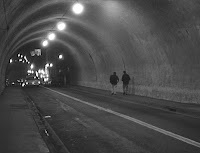 Some of the guys pick up a couple of girls and take them on a hair-raising drunken car journey down the Third Street tunnel next to the Hill's funicular rail station and there's a tense rest stop at local gas station where one of the girls refuses advances from one of the guys and they abandon her. There are bar room brawls as the frustrations of such makeshift lives spill over. They all drift in and out of darkness, lost and with apathy towards any attempt at advancement. This is carried by the monologues on the soundtrack, naturalistically regaling us with their interior thoughts and feelings. The film also has a curious non-naturalistic edge to it because pretty much all of the dialogue was re-recorded separately and then looped painstakingly back onto the film. There are noticeable disparities between the movement of the characters mouths and the dialogue that add an almost dream like, slightly time-shifted quality to the narrative. It's also a vital record of an area of Los Angeles that no longer remains because civic redevelopment in the 1960s cleared the areas that were deemed eyesores and it offers the first stirrings of a new American cinema, born out of both a documentary tradition that harks back to Humphrey Jennings and anticipating the naturalism of the French New Wave and the work of Cassavetes. Added to this is a great rock soundtrack from The Revels that underscores the fag end of the 1950s depicted here. Downloadable PDF files of Kent Mackenzie scripts, thesis, press kit and film notes. 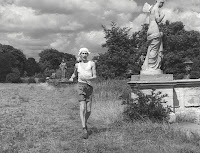 In stark contrast comes The Pleasure Garden, a short film made by bisexual American poet James Broughton and shot in the grounds and ruins of the Crystal Palace Terraces. Known to many as the father of the independent West Coast cinema, James Broughton's career spanned 40 years, beginning in 1946. This short film, made in 1953, is a lyrical, poetic depiction of a group of eccentrics living a seemingly idyllic life in the ruins, freely doing as they please. They cycle, run races, pose as statues and act out their true desires. Then a sombre figure, Colonel. Pall K. Gargoyle, a funeral director by all appearances, played by John Le Mesurier, and his equally censorious Aunt Minerva, arrive at the park and apply their deeply conservative moral code to all the liberal freedom around them, slapping up forbidding notices to stop all the fun, throwing people behind bars, forcing bland traditionalism to replace surreal liberalism and modernism. 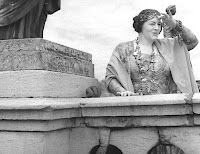 The muse is released and freedom restored by the carefree Mrs. Albion, played by Mesurier's then wife Hattie Jacques, who uses her magic scarf to free minds and hearts. Passion, desire and happiness return to the gardens and the Colonel, his Aunt and their repressive laws are sent packing. The characters find love and inspiration in the gardens, artists find their muses, repressed women find the men they're looking for and modernism and freedom of expression triumphs. It's as odd as it sounds and is a visually surreal, Cocteau-like stream of consciousness that rather strangely and symbolically depicts the struggle of a modernist Britain attempting to emerge from the wreckage of war and the mill of conservative tradition. It's a bohemian vision that chimes with the emerging counter-cultural forces that were already about to shape the 1960s and is a sweet ode to untrammeled desire. Photographed in gorgeous black and white by the legendary Walter Lassally, (he would go on to work with Lindsay Anderson, who briefly pops up here in a cameo role, and the Free Cinema movement and become a key figure in the British New Wave of the 1960s) the film won the Prix de Fantaisie Poetique at Cannes in 1954. Its statues springing to life, people sitting in trees and surrealist misfits will not be to everyone's taste but it still weaves a magical spell in honour of the Pleasure Principle. 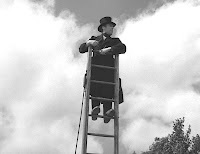 There's also a fascinating short documentary The Phoenix Tower, made in 1957, that charts the construction of the BBC's Crystal Palace Television mast. The film was used for colour test transmissions for BBC2 back in 1964 and it's a lovely historical record for those interested in the engineering behind its construction. The illustrated booklet also contains a history of the Crystal Palace, review and notes. Wow - two amazing releases from the BFI! 'The Exiles' sounds really interesting, I'm looking forward to seeing it. 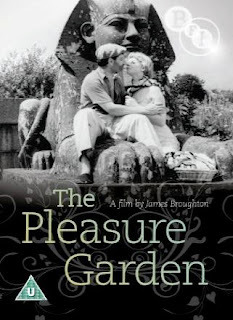 'The Pleasure Garden' is a wonderful short film, it's stayed with me since I saw it at the BFI Mediatheque a few years ago so it's great it's finally got a DVD release. I'll need to go and have a dig in the Lindsay Anderson Archive and see what we've got on 'The Pleasure Garden'. Thanks for the reviews, I'll go add them to my Amazon list now!